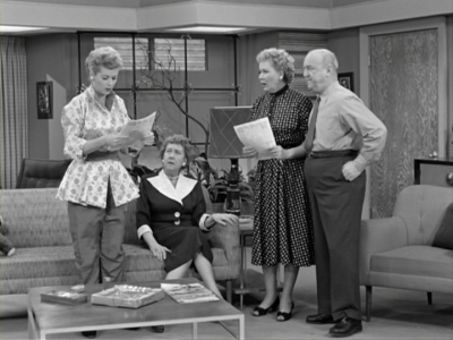 In order to wangle an appearance in a TV fundraiser hosted by her husband, Ricky (Desi Arnaz), Lucy (Lucille Ball) resorts to a little unsubtle extortion, threatening to sabotage Ricky's upcoming "Photoplay" magazine article unless she is allowed to perform. After several misfire rehearsals, Ricky finally finds the "perfect" role for Lucy: as the bull (in full costume) in a "matador" dance. Lucy agrees to the dance but not the costume...and on the night of a telecast, "bullfighter" Ricky finds himself face to face with a very benign-looking cow (and guess who's playing the other end of the cow? ).